In this edition we present to different and complementary ways of understanding this concept. We bring under the focus light two of the worldwide most renowned schools of Yoga and Pilates. Namely Fletcher Pilates® and Iyengar Yoga. Fletcher Pilates® is reputed to be one of the classic schools closer to the source, Joseph Pilates himself. We have a direct student of Ron Fletcher, Sarah Woodhouse coming from UK, to share three amazing workshops, including the famous Fletcher ABC’s. 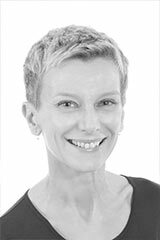 Anya Glushkova, only Fletcher Pilates® certified teacher in Romania and in this part of Europe, will be the chairman and will also teach sessions representing exclusively that school. For the first time in Romania, a full weekend dedicated to Fletcher Pilates® is an event to celebrate. Iyengar Yoga is probably the worldwide most respected alignment style of Yoga. And obviously, it is much more than this. The teachings of BKS Iyengar have deeply pervaded the way that the world understands today the practice of Yoga. We are bringing to Bucharest Stefano Bendandi, an Italian Iyengar Yoga certified teacher Junior Advanced 2, directly from India where he lives and teaches at his own Yogashala in Gokarna. Natalia Sibiryakova from Russia and Hajnalka Sarig from Hungary, friends from nearby countries will come to share part of the program as well. Sessions and workshops will be carried out at CARO hotel in Bucharest, a perfect location. Get ready, book the date, get in touch and please spread the word. This is unique. Saturday: YANG Day… YANG means the sun energy, pure fire. An explosive program with Functional Training, Dance and Step. By request we bring again to Romania the lovely, eccentric and charismatic Anastasia Alexandridi from Greece; one of the best Dance specialized international presenters. For Functional Training you will work out hard and smart with Lorenzo Sommo from Italy; a specialist forged by Reebok and other important schools worldwide. What about Move On team? A part our three renowned internationals Julio (Spain), Per (Norway) and Kiki (Romania) presenting in events around the world; also international this season are Iulian Panait (invited recently to Greece) or Raul Toma who is currently working as Premium PT in London, UK. With all of us, our golden team will share energy and good mood: Izabela Lacatus, Raluca Babaligea, Cristina Neacsu, Andreea Pavel and many more friends and professionals. Last year we revolutionized the YANG program by creating a Minimasterclass section that make possible to try much more sessions in a day. We combined 50 minutes and 25 minutes masterclasses giving you more possibilities for study, more ideas and more fun. After YANG comes the NEW FACES OF FITNESS COMPETITION OF ROMANIA. Winner will get a full paid participation in a secret international open competition abroad and a personalized training conducted by Move On team; Kiki, Per and Julio for instance. 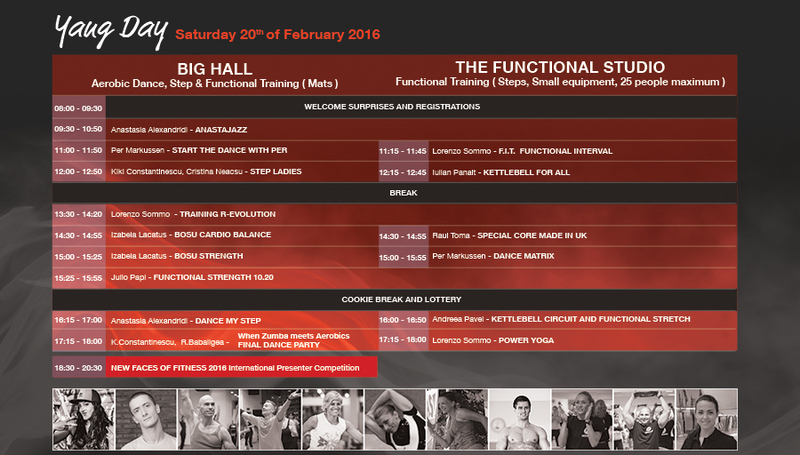 Saturday, February 20th, classes will take place in two different areas: Big Hall and The Functional Studio. For a better organization, please register at contact@move-on.ro for the classes you want to attend! 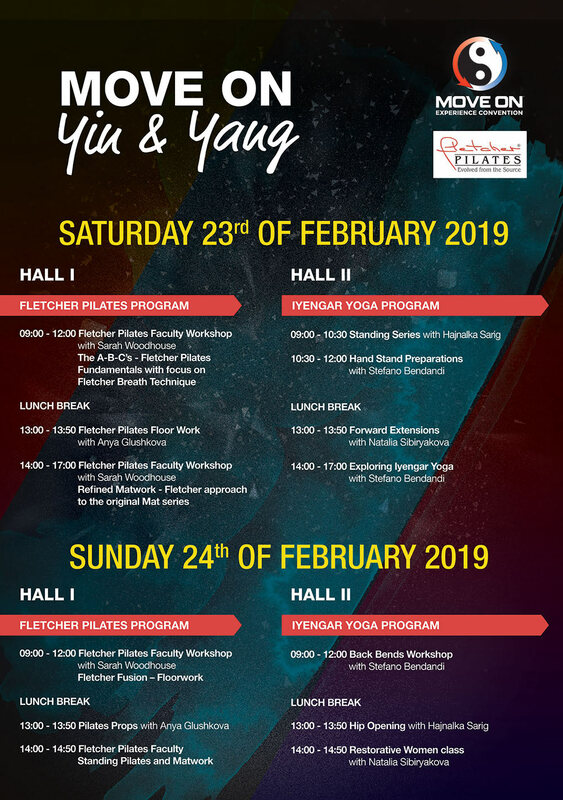 Sunday: YIN Day… YIN energy is the moon, the calm, the flow… Last year we introduced for the first time in Romania a full Fletcher® Pilates Fusion class with Anya Glushkova. This year we are honored to bring to Romania two of the Fletcher® Pilates Faculty Teachers in Europe, Cinzia Galletto and Maximilian Stohr. They will conduct Masterclasses and a specialized Fletcher® Pilates Workshop only available for Move On certified instructors. 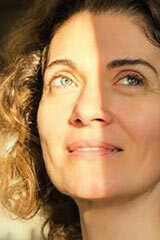 Sara Bucurescu will represent Move On Pilates School with a powerful Mat Work Advanced class. Hatha Yoga will be presented with two extended practices of 75 minutes each: one Hatha Yoga Asana Practice with Julio, and another Hatha Yoga session taught by Alina Grecu and Ovidiu Atanasiu, both 200 Hours Yoga Alliance certified teachers. We will end the day with a full Yogilates session with Carlos Abbate from Argentina, bringing his special mix between Yoga and Pilates; it is a beautiful opportunity to watch and share another type of deep body and mind work, and "finish the event in beauty".